I’m going to combine these two into one post, because I’m lazy and want to get back to actual sewing! Let’s start with the inspirations first! 1. Pinterest! Whenever I want to be inspired, I just load it up and have a browse. Of course, this leads to me pinning many, many things that never get done, but it’s nice to just scroll through and see what other people have made or check out new styles. I’ll admit, though, I use it a lot more for baking than I do for sewing! 2. Kollabora! I loved Kollabora when I first discovered it, and for a while, it seemed like everything I saw on there was amazing. As with anything, though, as it got popular, the quality of the posts seemed to get a bit lower, and combined with their crappy TOS, I’m starting to go off them a bit. But there are still lots of lovely things on there, and it’s still miles better than Craftster. 3. Reddit! I’m an avid Redditor and one of the main subreddits I hang out at is r/sewing. I love helping people who have questions, seeing the amazing things people make and just discussing sewing stuff with likeminded people. 4. Going shopping! Both online and in the real world, looking at RTW clothes is always inspiring for me. Being able to examine items of clothing in stores helps me envision how they were constructed, and I can keep somewhat abreast of fashion trends, even if I’m not really interested in following them. Modcloth is perhaps my best source of inspiration – the clothes they sell almost always match my style, and I must have about 50 of their dresses pinned to my Inspiration board on Pinterest by now. 5. My fellow bloggers, of course! I follow about 150 sewing blogs (I’m not even kidding) and settling down with a coffee to check my RSS feeds in the morning is one of my favourite parts of the day. I wanted to pick 5 bloggers I find the most inspiring, but picking 5 from 150 was extremely difficult, so I actually ended up with more! paunnet – her style is so cute and adorable, and through her I first found out about Deer&Doe patterns, when they were still only in French! 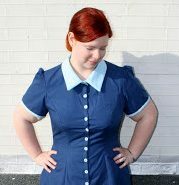 peneloping – another adorable seamstress with amazing style, her ability to make “copycat” versions of RTW clothing is nothing short of incredible to me. tilly and the buttons – her patterns are lovely, and I’m so inspired by the way she’s making her hobby into her career! I can’t wait for her book, and I love reading her tips and tricks on sewing. I’ve learned a lot from her! 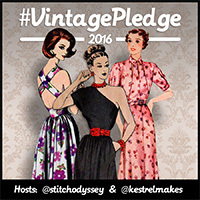 lladybird – Lauren is hilarious, and she is probably the most prolific seamstress I follow! She made, I believe, 86 garments this year, which is amazing – and they all look fantastic. making it well – she has wonderful style and really knows what suits her – and I love how down-to-earth and honest she is about her sewing adventures. dolly clackett – she makes the best dresses, end of story. She inspired me to try the By Hand London patterns, and I love reading her blog posts and seeing her cute little face in all her lovely makes. That’s not creepy, right? three dresses project – I had the honor of meeting Leila in person recently at the SF sewcialist meetup, and she was so kind and lovely! I wish I had half her energy and determination – she knows what she likes to wear and just goes for it! Plus she hosts the weekly Fabric Chat forum on Twitter! 1. Make pants! I’ve had the Thurlow pants pattern for forever, and I really need to stop being scared of them and just make them already. How bad can it be? 2. Find a good undies pattern and proceed to make all my underwear. I did have a go at this in 2013, but the pattern I chose was just too low-rise for me, and they’re not comfy. 3. Make more clothes for Luke! He says he would like to have a wardrobe made by me, and I’m excited by that prospect. Especially now that Thread Theory have released such nice patterns for men, I look forward to making him stylish clothes that fit. 4. Blog more often. It’s a difficult balance, for me – I don’t want to make stuff just for the sake of blogging about it, but I also know I could blog more often than I did this year. Hopefully I can get into a more regular schedule with my blogging and also tidy it up a bit – I’d like to learn more about prettying up my blog and making it a bit more pleasant to look at. 5. Draft my own patterns! This is something I’ve only really considered doing this year, and it’s something I’d really love to do. I have lots of ideas, and I’m hoping to learn more about using software to draft patterns and grading and all that stuff so I can put my designs out there. I’m inspired by Rachel from House of Pinheiro who just released her first pattern this year! I’ve loved reading everyone else’s Top 5 lists, and I’ve come across so many new and wonderful blogs to follow because of it! Happy New Year to everyone who reads my blog, and I hope 2014 is an amazing year for all of us!